The Swarovski items worn in SkyFall by Severine: Bamboo necklace and earrings and Queen Cobra Double ring. Will Severine wear the Love Knot earrings with this outfit in the Shanghai scenes? On the poster we can see Severine wearing the Black Bamboo Pendant ($170) , Black Bamboo Pierced Earrings ($170) , and Bond Queen Cobra Double Ring ($310) (she wears the 'double' version of this which means it's worn on two fingers). In Bond on Set, we can see she also wears Bond Love Knot Bangle, Small ($270) or Medium ($270) . Severine wears these items in the casino scenes in Macau. Two sets of Bond Love Knot Pierced Earrings ($150) with diamonds were made for the film: one set was auctioned at 50 Years of James Bond - The Auction at Christie's which took place on 5 October 2012, where it was sold for £18,750 ($30,319). The other set has been retained by Swarovski to make crystal replicas for retail. We are not sure that these earrings are worn in the film, but we can see Bérénice Marlohe wearing the earrings in the new Heineken commercials. For his Love Knot theme, Stephen Webster turned to an eternal symbol of devotion to express the strongest of lovers bonds. Available as a pendant, pierced earrings, bangle or ring, the intricate yet gracious design is highlighted by both black and clear crystals in a Pointiage setting; Swarovski’s exclusive hand set technique provides a unique sparkle and increased sophistication. The Black Bamboo theme brings to life the air of elegancy inherent in this bamboo-inspired design. Whether interpreted as a pair of 7cm long earrings or a stunning pendant, these pieces make a dramatic impression. The refined Pointiage setting flows across the piece and hints glamorous adventure and excitement. The ring at the heart of the Heat Seeker theme possesses a boldly original shape, certain to gain attention. Nevertheless, it also retains an essence of femininity achieved through the sophisticated use of crystal. The matching pendant and earrings are delicate interpretations of the statement ring design. The mysterious appeal of the snake is captured in the Queen Cobra theme. The conceptmakes a powerful on-trend impact. Shimmering in the double ring is a large crystal symbolizing the apple, the forbidden fruit and the intense red color of the snake’s crystal eyes flash dramatically against the black crystals of its body. This eye-catching line also includes a pendant and a single ring. The Swarovski SkyFall collection is available in Swarovski stores and online. 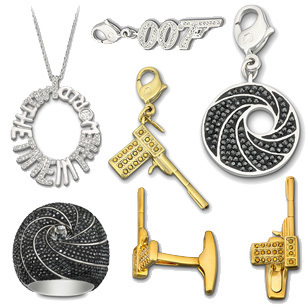 Swarovski also created a special James Bond collection of small pendants, rings, cufflinks and charms, see all items here. Bérénice Marlohe featured in Swarovski advertisements for a completely different collection, King of Jewels which is not related to SkyFall (read more).